* 8051 / 89C52 CPU operating @ 11.0592 MHz. * 32K user RAM with Battery Backup using NICD Battery. * 16K bytes of powerful monitor EPROM. * One memory socket is provided for expansion upto 64K. * 48 I/O lines using 2 Nos. of 8255 brought at 26 Pins FRC Connector. * Three channel timer / counter using 8253. 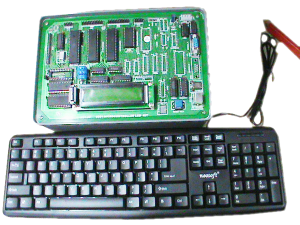 * 20 x 2 Backlite LCD Display with 101 ASCII Keyboard. * Two External interrupts INT0 & INT1. * RS – 232C using RX / TX of 8051. * Single Line Assembler / Disassembler. * Powerful Commands like Examine / Edit Memory, Examine / Edit Resistor, Single stepping, Execution, Break Point can be used through ASCII keyboard or PC serial mode. * Facility for Downloading / Uploading files from / to PC. * All Address, Data, Control and Port lines are available on 40 Pins and 10 Pins FRC Connector. * In – built power supply of + 5V / 1A, + 12V / 150mA. * User’s Manual with sample programs.